Within Teamwork Projects, you can add a dependency relationship between tasks to make sure that tasks are completed in a particular order. When you create or edit a task, go to the dependencies section. 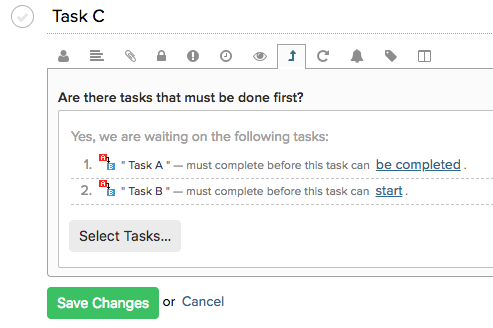 From there, click the Select Tasks button and you can choose the task or tasks that need to be done first. Just click the checkbox next to the task(s) that should be done first. You can use the menu in the top left of this screen to choose tasks from a different project, too. 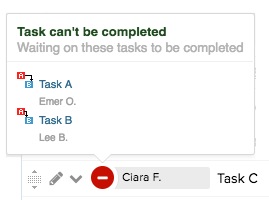 When you have chosen the predecessor tasks, click Select These Tasks and you'll see them listed in the task area. 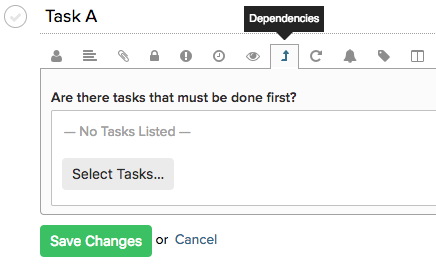 You can click the link to change the dependency type from finish-start to finish-finish, click the x on the right to remove any of the dependencies, or click the Select Tasks button to add more. When you save the task with the new dependencies, you'll see the an icon to show that the task is waiting on other tasks, with links to those tasks. When you complete the predecessors, the task will be unblocked so you can complete it.